Inspiration: I wanted to make some cute baby dresses in bright patterns. I usually sew knit baby clothes on my serger, but I was visiting my family in Massachusetts for a week and since I'd be using my mother-in-law and mother's unfamiliar sewing machines I decided to stick with wovens. I picked up some cute, but cheap, quilting cotton at Joann's and a $1 pattern, and went to town. That was back in March 2010, when I was still pregnant. It should have been a one-day project, but my mother's sewing machine broke down, and the dresses went unfinished into my suitcase, and I worked on them a bit in September 2010 but got distracted ... so they sat there until my now-toddling daughter was 13 months old and I realized I had better finish them before they got too small for her. 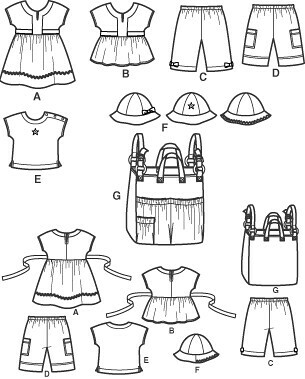 Simple woven baby separates: Baby Dress, Top, Pants, T-Shirt, Hat and Stroller Bag. The tops and dresses have a center band, waist seam with tie belt, cut-on (kimono?) cap sleeves and gathered skirt. This review is for the dress. XXS-L (Newborn-18 months) I made the 12 month size, and found it fits my large 24-lb toddler just fine, even though she usually wears 18 months in ready to wear. She can probably wear it for at least a few more months. Did it look like the photo/drawing on the pattern envelope once you were done sewing with it? Yes. Were the instructions easy to follow? Definitely. But the project took a lot longer than I expected, due to the bands and belt and top-stitching and other fiddly bits. It wasn't really the "easy-to-sew" project I expected. What did you particularly like or dislike about the pattern? It's simple, cute and stylish, and there are a lot of options for playing with color and pattern. For this version I did the band/belt in the same color as the bodice and skirt, but I'm finishing up another version with a contrasting band and belt. 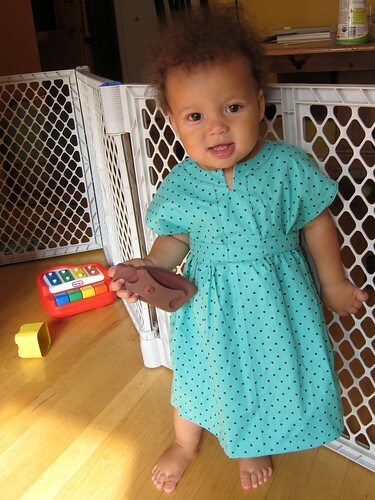 Fabric Used: Turquoise quilting cotton with brown polka dots from Jo-Ann's. With about as much drape as a paper bag or hospital gown--I won't use this stuff again. It's totally off-grain--the polka dots don't line up with the grain at all. What a mess! But my toddler runs around so fast no one will notice, right? I had to look up how to do a thread chain (the back neck button has one instead of a buttonhole) but that was easy once I got the hang of it. I hemmed the skirt by hand as that was something I could do while my toddler was zipping around the room without worrying about her grabbing dangerous stuff out of the sewing machine cabinet. My top-stitching isn't the best or most even. I just pinked the seams. She's only going to fit into it for a short while, no need to go all heirloom on this thing. Successes: This is the first complete sewn baby garment I've actually finished since I gave birth to my baby 13 months ago. Room for improvement? : I need to work on my top-stitching. And when/if I make this again, I'll use better fabric. Also--my productivity rate is crap. Would you sew it again? Would you recommend it to others? Yes and yes--I'm finishing up another version now. 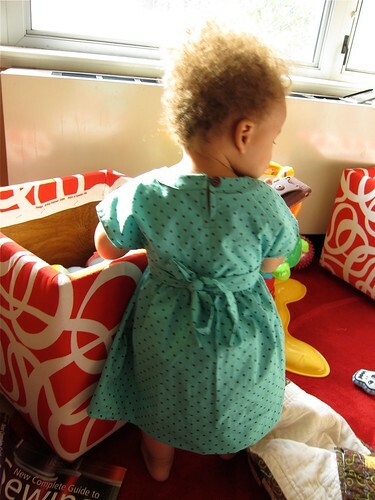 Conclusion: Cute, fun baby dress pattern, good for playing with color and pattern. And Miss Z seems to like it too! Adorable dress and baby! I am glad you are back sewing again! 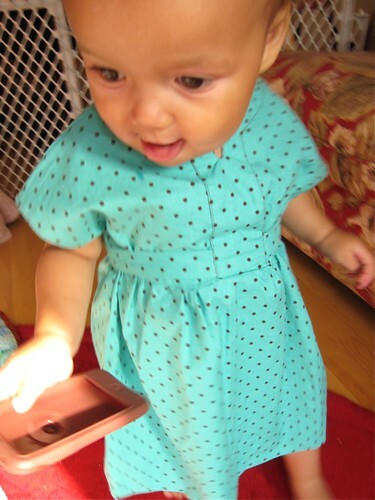 Both your daughter and the dress are outrageously cute! You're daughter is so cute (and so is the dress). Great design for a baby dress! Cool color and comfortable garment was use. Keep it up!